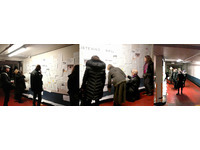 The Listening Wall is a wall of curated scores for listening and sound related instruction scores. In 1966, sound art pioneer Max Neuhaus stamped the word “LISTEN” onto the hands of participating audiences and took them on a walk around Manhatten, listening to industrial rumblings, buzzings of Puerto Rican street life and lastly, a percussion performance. It marked his transition from percussionist to sound artist (although of course at the time the term was not yet used). At the same time, we live in divisive times, and walls are units of separations. Say, like a wall of silence for example. Or indeed the Great Walls of China / Mexico. This one is not like that. Because when we listen, we can’t fail to connect. Take one of the scores provided here. Listen with it to this environment. 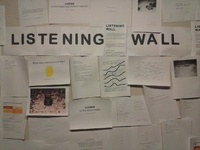 Or make some sound yourself in tune with your chosen score, say, kicking a wall or a stone. 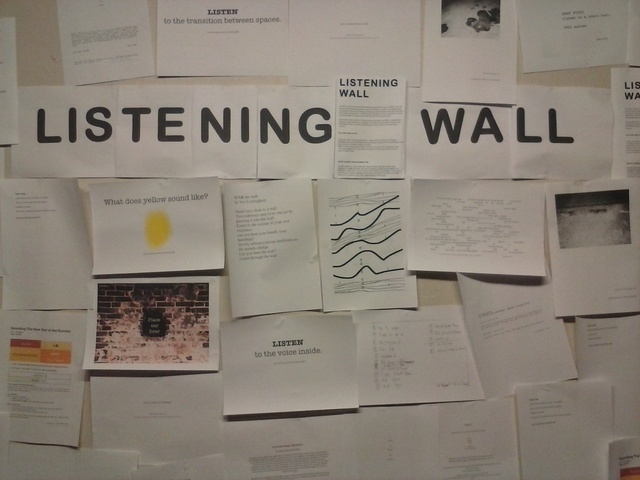 When’ you’re done, feel free to add your own listening suggestions on the back and tack it onto the wall. Or take one home with you and do it later.